This FAQ is about the Test-Scratch-Wiki and creating of International Scratch-Wikis. You can add new questions here in this Scratch Forum Thread. Find FAQ's about Scratch itself at: en:FAQ. 1.1 What is this FAQ good for? 1.2 How can I ask new questions or give better answers? 1.3 What other FAQs could I use? 2.1 What is a Scratch Wiki? 2.2 How can I join/create a Scratch-Wiki in my Language? 2.3 Why are there "Real-Scratch-Wikis" and "Test-Scratch-Wikis"? 2.4 Why should I join the "Test-Scratch-Wikis" If I'm already at a "Real-Scratch-Wiki"
2.5 For which languages do "Real-Scratch-Wikis" or "Test-Scratch-Wikis" already exist? 2.6 How do I start a new scratch-wiki if there is no one for my languages? 2.7 How did the Test-Scratch-Wiki come into Existence? 3.1 How do I request an account at the Test-Scratch-Wiki? 3.2 How could I find somebody who is Mediawiki-Insider? 3.3 Can somebody help me? 3.4 How can Wikians of the English Scratch-Wiki help us? 3.5 What should be my "first steps" after my account is created? 3.6 How can I see what's going on on the wiki? 3.7 How can I find "co-authors" of my language? 3.8 When will "my wiki" be transferred from "test"-Wiki to a "real"-Wiki? 3.9 What does a Wiki need to be "strong enough" to survive? 3.10 What is a "Community Portal"? 3.11 Where do I get the best overview on what happens at all of the international Scratch-Wikis? 3.12 Do I only have to translate or can I create my own independent content? 3.13 Does it make sense to copy-translate Articles from the English Scratch-Wiki? 4.1 Where do I find a basic introduction to editing the wiki? 4.2 What are Talk-Pages and how do I use it? 4.3 What is a Template? 4.4 What is a Category? 4.5 What is a Wiki-Skin? 4.6 What is the "Block Plugin"? 4.7 What is a "Name Space"? 4.8 How does the account request system work? 4.9 How do I link my Wiki to the other International Scratch-Wikis? 4.9.4 Linking all Articles of all Scratch-Wikis. 4.9.5 Can a Bot do Interwiki-Linking better? 5.1 Which Wiki-Pages should I start with and how? 5.2 How do I create the "Scratch Wiki Home Page"? 5.3 How do I create the "Help Pages"? 5.4 How do I create the "Community Portal"? 5.5 How do I create the "Category Pages"? 5.6 How do I create the "List of all Scratch Blocks Page"? 5.7 How do I create the "Scratch Blocks Pages"? What is this FAQ good for? This FAQ (Frequently Asked Questions) is a "work in progress" aimed at answering all question that can be asked about "building a Scratch Wiki in your language". Originally it was made to help authors of one of the Test-Scratch-Wikis but it is also very useful for authors of the existing Real-Scratch-Wikis and for anybody who is interested. You can ask questions in this Scratch thread. en:Scratch_Wiki - To learn about Scratch Wikis in general. How can I ask new questions or give better answers? What other FAQs could I use? It has many questions (some still missing here) but it does not focus on the international scratch wikis like this one. Find FAQ's about Scratch itself at: en:FAQ. What is a Scratch Wiki? The Scratch Wiki is a collaboratively-written wiki available for free that provides information about the Scratch programming language, its website, history and phenomena surrounding it. The wiki is supported by the Scratch Team, but is primarily written by Scratchers. The Scratch Wiki is a popular source of information for scripts and tutorials and it continues to grow as Scratchers use it as their primary source of information. How can I join/create a Scratch-Wiki in my Language? Because it is not so easy to set up a Mediawiki and to establish a community, we have this kind of "Scratch-Wiki-Incubator" or "Giant Multi-Language-Sandbox" here at http://test.scratch-wiki.info/ to start a scratch-wiki in a language that doesn't exist. There is also an international community to help you. Why are there "Real-Scratch-Wikis" and "Test-Scratch-Wikis"? Real-Scratch-Wikis are Scratch Wikis that exists in their own domain or subdomain. They existed years before http://test.scratch-wiki.info was set up (in 9/2015). The original Scratch Wiki was the English one. The DACH, INDO, RU, JA, HU and the NL Scratch-Wikis where set up later as sister projects by the international Scratch Community mainly driven by the DACH-Scratch-Wikians. Because they saw - after first successes with DACH and INDO - how difficult it is for the starting Scratch-Wikians to build up their Wiki and their Wiki-Community, they decided not to set up separate Wikis for starters anymore, but to use this Test-Scratch-Wiki as an "Scratch Wiki Incubator" where starters will get help and coaching from the international community until their Scratch-Wiki "can stand on its own feet". Why should I join the "Test-Scratch-Wikis" If I'm already at a "Real-Scratch-Wiki"
If you are an author at one of the international "Real-Scratch-Wikis" you should additional join this "Test-Scratch-Wiki" to get in better connection with the international Scratch Wiki community and the Coaches that could also help you at your Scratch-Wiki. At your Scratch-Wiki there are only that few people of your language: The Scratch Wiki Coaches can't patrol all international Scratch-Wikis regularly to find out if somebody needs help with Mediawiki-Syntax, Templates, etc. but at the Test-Wiki we can do that. For which languages do "Real-Scratch-Wikis" or "Test-Scratch-Wikis" already exist? Test-Scratch-Wiki:Currently Existing Wikis - Look here to see if a Scratch-Wiki for your language already exists. How do I start a new scratch-wiki if there is no one for my languages? How did the Test-Scratch-Wiki come into Existence? How this whole thing started - the thread at the English Scratch Wiki Community Portal that brought this Test-Wiki into existence. How do I request an account at the Test-Scratch-Wiki? Go to Special:RequestAccount to create your account here. Instructions on what to say are present on that page. Please don't waste the time of our admins by asking for an account if you not really interested to work here and edit much: An account here is not a "status symbol" but a commitment to work and improve the Test-Wikis. How could I find somebody who is Mediawiki-Insider? Read #Can somebody help me? Because their time and power is limited, try to invest a little bit of your time and power to find an answer out yourself. Some good ways to get help include: visiting the Help pages, reading this FAQ, and doing tests in the Sandbox. If your question could be of general interest please ask it at this FAQ's Forum so it can be added to the FAQ for others in the future. Go to the Talk-Page of the Wiki article and start a discussion there. This is not recommended here, but in a high frequented Wiki like Wikipedia, it's typical to discuss at the articles Talk-Page. Please (!!!) only as the last option (Don't steal the time of others only to save time yourself!!!) If you need a very fast reaction or nobody answers your question after a long time of waiting you can also write an email to user:mtwoll: mtwoll [at] gmail [dot] com. He will be happy to help you with things only he could help you with, but he would also be very unhappy if you bother him with things you could find out yourself or asks others for. How can Wikians of the English Scratch-Wiki help us? What should be my "first steps" after my account is created? Read our Help:Welcome-Tutorial (you can also read it at the English Wiki here en:Help:Welcome. If you see "log into the wiki" instead just click it to go to the login page, enter your username and password there and click "log in"
Read and answer your "Talk-Page". Go to your "Talk-Page" by using the second menu item from the user menu. If somebody left you a note please answer it, say "hello", "thanks" or ask a question to get in communication with the community. Use English language for communication with the whole community and the coaches. You can use your language if you found somebody who knows it but be aware that most other users will not understand it. Best use both languages your's and English. Don't be shy about your English: Most people here are "non native English speakers" . How can I see what's going on on the wiki? How can I find "co-authors" of my language? To find new co-authors here are some ideas that have been successful before. All Ideas that have to do with "meeting" should only be practiced by adult Scratchers. When will "my wiki" be transferred from "test"-Wiki to a "real"-Wiki? We started the Test-Scratch-Wiki because we have seen that it is very difficult for a new Scratch-Wiki to survive because it is not "strong enough". We will always suggest staying within the test-wiki until your wiki is "strong enough", because you will be alone with the people of your language after it has been made a Real-Scratch-Wiki. Please get in touch with a admin of the Test Wiki if you think your wiki is ready to stand free from the test wiki. We'll review your work and if we think it is okay we will create a Real-Scratch-Wiki. You will get accounts for it and will transfer all the content over for you. What does a Wiki need to be "strong enough" to survive? Note: These must be good enough to be used as "best practice" for new articles, templates and categories. New authors will always look at old existing items to see how to make new content, so if you have good starting-items (articles, templates, categories), the whole wiki-future will profit from that. When you think your wiki is "strong enough" to survive, feel free to contact user:Jvvg, user:ErnieParke or user:Mtwoll, who will help you to transfer the wiki of your language from a Test-Scratch-Wiki to a Real-Scratch-Wiki. What is a "Community Portal"? Where do I get the best overview on what happens at all of the international Scratch-Wikis? de:Scratch-Wiki:Watch is a link-page to look for and to help the international scratch wikis. You find there all admins and their role at the different Real-Scratch-Wikis. Also, you will find links to the most important pages of the international wikis, like "Recent Changes", "Active Authors" and so on. Be aware, it is easy to get lost in the international scratch wikis for people who can not read the language of the wiki. It's easier to jump from a link at de:Scratch-Wiki:Watch to a special page. Do I only have to translate or can I create my own independent content? Does it make sense to copy-translate Articles from the English Scratch-Wiki? Because the English Wiki has over 1000 Articles and exists since 2008 there is a good chance that there is already a popper English article about most Scratch-Related subjects that could help you to get a start with your article in your language about that subject. You can Interwiki-Link this Article to your new article so it's easy to jump there. You also can copy the English text to make use of it's format and templates (most English templates and pictures have been copied here, so this could work very easy). Don't copy too much English text without translating it immediately else the wiki of your language will get a mess. Where do I find a basic introduction to editing the wiki? What are Talk-Pages and how do I use it? A talk page is actually very similar to any other wiki page, but it is in the “Talk” namespace, to keep it separate from the articles in the “(Main)” namespace (See #What is a "Namespace"?). As with any wiki page, you can edit it, link to it, and view the editing history. A special Talk-Pages are the Community Portal where the wiki-community has their general discussions and the user-Talkpage that every wiki author has for personal communication. Normally templates should have names in the language of the wiki (see this example-list in the German DACH Scratch Wiki). To make a good and easy start here, we transferred the templates of the English Scratch-Wiki here (+ also the pictures). So it is possible to just copy an article from the English Scratch-Wiki here and it will be displayed properly with all templates (+pictures...). Later, when Test-Scratch-Wikis become Real-Scratch-Wikis its community can decide, if they want to translate also the template-names to their language, dependent if they have community-members with that know-how who wants to do this work: Templates can be easy as the ones above, but they also can get very complex so it is like coding to create and maintain them: But don't get worried for the first you only have to use the existing templates here and you can see how to use it, by just copying articles form the English Scratch-Wiki here and than translate it to your language. If you need additional templates, please name them this way: Template:LANGUAGEPREFIX/TEMPLATENAME. Replace LANGUAGEPREFIX with the adequate prefix for your language. You can look it up at []. Replace TEMPLATENAME with a descriptive, simple name for your template. Example: to create a template named "topic" in English you would create "Template:Eng/Topic". All Real-Scratch-Wikis beside EN: and DE: have a big problem with templates, because they all started with zero (see list-links below). This template-matter and our solution to it (above) is one of the problems we want to solve with Test-Scratch-Wikis. Categories helps to structure the Wiki and to find things that belong together. The "Wiki-Skin" provides the wiki with a special "look and feel" and is partly language dependent, so it must be translated. The Wiki-Skin Determines the Header, Footer an Side-Bars of the wiki as well as the colors and Typographie. It consists of a set of files text and image files (normal transported in a ZIP-File) that has to be installed "inside" the wiki (copied at the File-Server where the wiki runs, you need FTP Admin rights to do that, Wiki-Admin rights are not enough). You can download the Skin from Github in the English version, translated it locally and send it to the Sysop-Admin who can install it. What is the "Block Plugin"? The Block Plugin, also known as scratchblocks2, is a plugin for the Scratch Wikis and Scratch forums that allows script images to be constructed through text that is parsed and rendered. It saves lot's of work because you dont have to sceenshot and upload Block-Pictures to show them at the wiki, but you just have to type in the block-Names.You can try playing around with the plugin on the test page. What is a "Name Space"? In the Test-Scratch-Wiki the most important usage of namespaces is to distinct the languages. So e.G. the prefix "Ita:" in http://test.scratch-wiki.info/wiki/Ita:Test_Scratch_Wiki_Home means, that this is an article of the Italian Test-Wiki. The Prefixes are named after ISO 639-2 codes for languages. In generals Pages on a MediaWiki wiki are grouped into collections called "namespaces", which differentiate between the purpose of the pages at a high level. Please note that you do not need to translate namespaces to your language. They are automated by the system and can be changed when you transfer to the real wiki. How does the account request system work? The new user is now accepted! The admin re-reviews it and then we go to "accept" or "reject"
Specially at the Real-Scratch-Wikis their admins seems not to know how the accounting system works in spite of they should be responsible for creating new user accounts. As there are some actions to be done to approve new accounts if you are an admin we have some Snippets here that can be "copy & pasted"
How do I link my Wiki to the other International Scratch-Wikis? This is the reason for the Interwiki-Links at "In other Language"-Menu at the left of the Article-Area at the homepage. This is the reason for the Interwiki-Links at "In other Language"-Menu at the left of the Article-Area at de:Wenn_Grüne_Flagge_angeklickt_(Block). If you put a colon in front of the LanguageID, you get a link to the Article of the other Wiki inside the WIki-Text, instead of a Interwiki-Link at the "In other Language"-Menu. (Example like above en:Scratch_Wiki_Home). Linking all Articles of all Scratch-Wikis. Can a Bot do Interwiki-Linking better? We are planing to have an interwiki-bot that does all the implicit-links (than our international authors only would need to put a link to the english-articles in their articles, and all other Interwiki-link could be done by the bot, because it's implicit). They have such a bot in WIkipedia that we could use for the Scratch-Wiki-Family. Which Wiki-Pages should I start with and how? To get used to it you could try to translate or create some short articles of your choice, but to get the wiki "ready to start" there are some pages that are really essential. How do I create the "Scratch Wiki Home Page"? 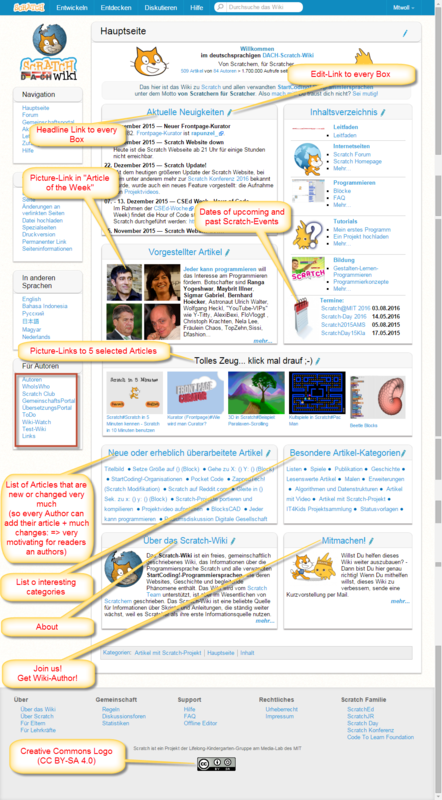 de:Hauptseite - Home Page of the DACH-Scratch Wiki, that has many additional features (see screenshot to the right). You can decide if you also want to have these features (or other new ones you invent yourself) in the Wiki of your language: Perhaps it's more easy to start simple and later add new features. In any case you should avoid "feature-overload". How do I create the "Help Pages"? You can try to translate the English Help Pages - they will let you see what the help pages should look like. How do I create the "Community Portal"? Simply create Project talk:Community Portal on your wiki, with some guidelines about how to correctly post, and you should be good! How do I create the "Category Pages"? it will add the page to that category - the title will appear on the category page, and the bottom of the page will show that the page is in that category. To create a category, simply create Category:Category_name on your wiki. To fill it up, just add pages into it. How do I create the "List of all Scratch Blocks Page"? You can try translating the Blocks page on the English wiki - for the list, see the section titled "List of Blocks"
How do I create the "Scratch Blocks Pages"? This page was last modified on 29 December 2018, at 04:04. This page has been accessed 155,252 times.